There’s some pretty incredible stuff in the southern hemisphere that a lot of us just take for granted. Australia's Fraser Island falls into that category for many people. It’s the kind of beach paradise that pops into your mind when you imagine beach paradises, yet even a fair few Queenslanders have never even made the short ferry ride over to the world’s largest sand island. If you’ve thought about a Fraser trip but never followed through, it’s time to get moving! The place is sensational and once you’ve been once, the temptation to go back is almost irresistible. Barges leave from a number of locations from Rainbow Beach and Hervey Bay to Bundaberg, but remember if you’re planning on driving, it’s 4WD only. There are tour operators on the island who can drive you around if you don’t want to take a car over. Don’t forget to sort out a driving permit, too! It’s easy enough to do but can easily slip your mind. There are plenty of camping grounds on the island; some where you can set up for yourself, others where everything is all ready to go, with tents and equipment already set up. It’s not quite glamping but at least you won’t need to lug all your own gear from the mainland. There are also two resorts on Fraser; Kingfisher Bay on the west side and Eurong on the ocean side. There are also a few holiday homes if you’re willing to spend a bit more. We’re sure you know how to use the interweb so you can research the options that best suit you. You don’t have to be on Fraser to take advantage of the region’s world-famous whale watching opportunities (oh hey, Migaloo! ), but if you’re on the island for more than a couple of days, you really should integrate it into your trip. Just another lifelong memory from your little holiday, whatever. 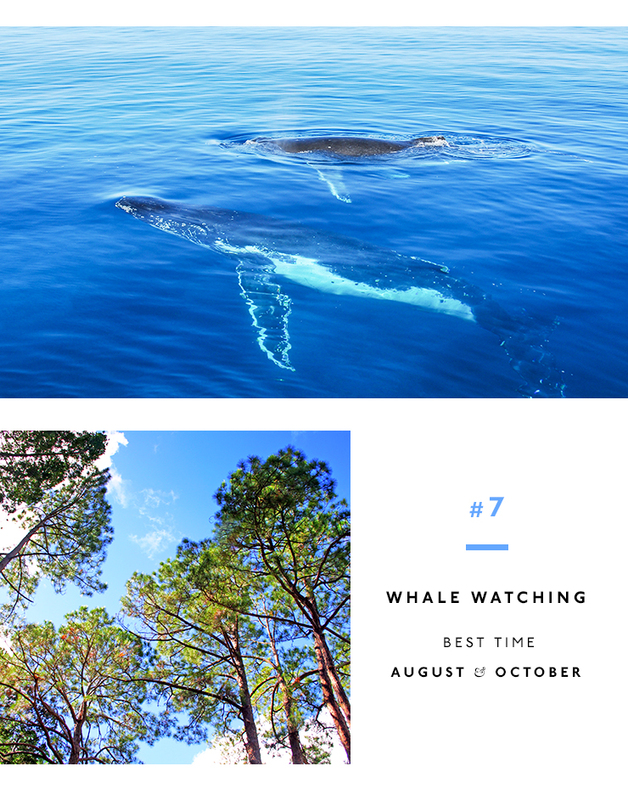 The strip along the Fraser coast between the island and the mainland is a naturally protected playground for the whales, who frolic with their young in its calm waters between August and October. A number of companies offer accommodation and whale-watching packages, so have a peek on the WWW for more info. Every angler knows that island fishing is better than mainland fishing. The best bit? You don’t even need to be an expert to throw a line in on Fraser! There are a myriad of spots where the fish will most likely be biting, from the still waters of the west side of the island to the ocean-side, where you can catch just about anything. Bait is available to buy at all the general stores—or you can pump yabbies in the more protected spots (while watching stingrays float lazily past). If you have a 4WD, or access to one, you really won’t be doing Fraser Island justice unless you take it over for some off-roading action. In case the penny hasn’t dropped yet, the whole place is made of sand, so if you plan to get from one side of the island to the other you’re going to have to take one of the sandy, bumpy, windy tracks. But don’t think of it as a chore, it’s terrifying BUT awesome. You’ll have white knuckles the whole time if you haven’t done much sand driving before, but just go with the flow and remember it’s only mildly embarrassing if (when) you get bogged and need someone else’s assistance to get out. The locals are used to it. Alright, you’ve done your white-knuckle driving through the centre of the island, it’s time to enjoy yourself on the beach highway. It’s hard to explain why, but it is a sensational feeling to cruise along the flat sands at up to 80kph with bush or cliffs on one side and the ocean on the other. Beware of rivulets and unexpected drops or dunes (oh, and landing airplanes), but otherwise it’s some easy driving. 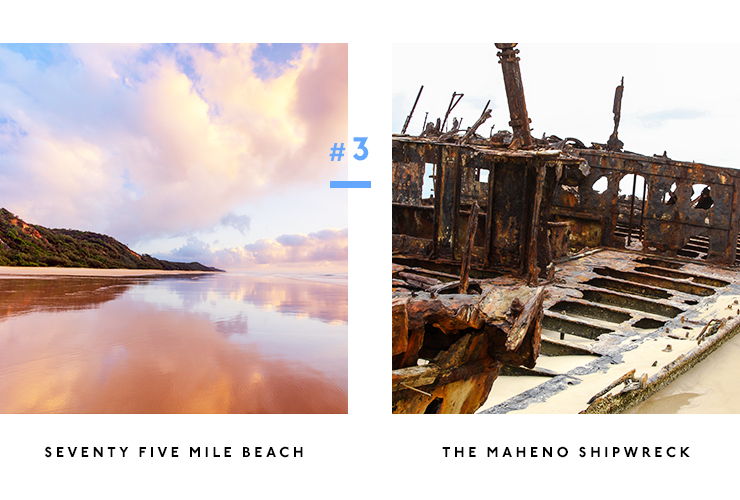 Like everyone else you’ll stop off at the rusting hulk that is the Maheno shipwreck and take a few arty photos, but you can also incorporate Eli Creek and some beach fishing into your drive. It’s worth cutting inland at Cromwell’s Break and checking out the underrated Lake Wabby as well. There is really no upper limit to the amount of quality bushwalking you can do on Fraser Island. I mean, if you’re a complete nutcase you can even do the 90km, 6-8 day Great Walk. I’m sure it’s very rewarding. Otherwise there are a myriad of shorter walks from numerous points around the island, which can incorporate light or heavy bushland, lakes, beaches and creeks, or whatever you’re in the mood for. Check out this handy map for ideas. Worth a trip to Fraser alone, Lake Mackenzie is something truly special. Pack a lunch (to be consumed in the designated picnic areas, not on the beach!) and make a day of it, because you’re not going to want to leave. Ever. You’ve probably seen the pictures but experiencing it first hand is something else entirely. Turquoise water and white sands surrounded by lush bushland is about as close to paradise as you’re going to get. And you won’t be able to get over the fact that the water is fresh, not salty. Take a million pictures but make sure you also just sit back and enjoy the view for yourself. For even more on point travel suggestion, click here.